Hizb ut Tahrir / Wilayah Bangladesh is issuing this press release to the Chinese diplomatic mission in Bangladesh, condemning the persecution of our Uyghur Muslim brothers and sisters, as part of the global campaign taken by Hizb ut Tahrir against the Chinese persecution of the Uighur Muslims. As part of that campaign, we are attaching the press release issued by the Central Media Office of Hizb ut Tahrir (CMO) in Chinese, English, and Bangla amongst several other languages, titled, “Khilafah will Liberate East Turkistan and will Free the Uyghurs from China’s Criminal Oppression.” We exhort the office of the Chinese diplomatic mission in Dhaka to deliver all of our press statements to the appropriate authority of the Chinese government. We are aware of the relentless persecution of our Uyghur brothers and sisters by the Chinese regime. 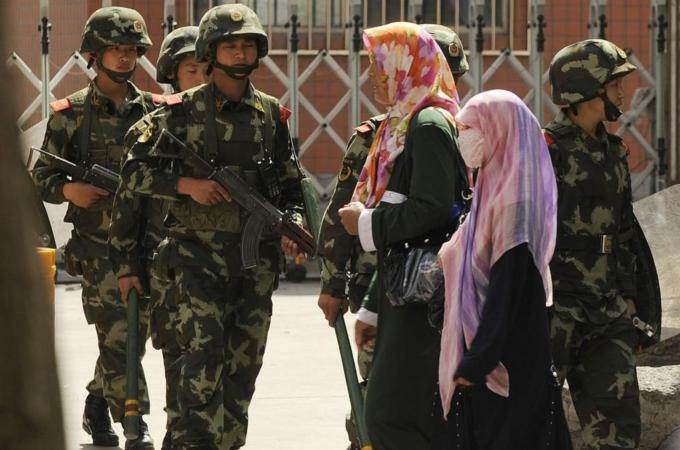 To erase their Islamic beliefs and identity, the brutal Chinese regime is forcing Muslims to adopt its atheist beliefs through a brutal campaign of intimidation, torture and even murder! The regime is preventing our brothers and sisters from attending mosques by closing them down, preventing them from fasting on the blessed month of Ramadhan, and banning virtually every Islamic ritual. They are appointing a Kafir Chinese man in every Muslim house to spy on them disregarding their privacy and sanctities, preventing the Muslim women from wearing Hijab and men from keep long beards, labeling Islamic greeting of Salaam and choosing to eat Halal food as extremism, and are forcing Muslims to abandon Islamic burials and accept instead the Chinese tradition of cremation! In their attempt to force the Muslims to leave their Deen (way of life), the brutal Chinese regime has established large detention centers – so-called “re-education camps” – and is holding behind their walls over one million Muslims – arresting intellectuals, scientists, thinkers and university professors. Is it not short-sightedness of the Chinese regime that they are showing this hostility against Islam and Muslims of East Turkistan not fearing the reaction of the vast Islamic Ummah? They should know that harming a Muslim in any part of the world is regarded as an attack on all Muslims, the Messenger of Allah ﷺ said: «مَثَلُ الْمُؤْمِنِينَ فِي تَوَادِّهِمْ وَتَرَاحُمِهِمْ وَتَعَاطُفِهِمْ مَثَلُ الْجَسَدِ إِذَا اشْتَكَى مِنْهُ عُضْوٌ تَدَاعَى لَهُ سَائِرُ الْجَسَدِ بِالسَّهَرِ وَالْحُمَّى» “The parable of the believers in their affection, mercy, and compassion for each other is that of a body. When any limb aches, the whole body reacts with sleeplessness and fever”. [Bukhari/Muslim]. The Chinese regime should know from its diplomatic missions around the Muslim world that the rage of Muslim Ummah are increasing against them, that they are condemning the brutal oppression, and demanding the immediate halt of these atrocities. Maybe the Chinese regime has been deluded by the treacherous silence of the Muslims rulers! The rulers of the Muslim lands have sold themselves for the promise of Chinese investments and trade deals, and they have abandoned the responsibility from Allah (swt) to help Muslims and have forsaken the Muslims. But these rulers do not represent the Muslim Ummah, and neither is the Muslim Ummah seduced by the promises of wealth! The Chinese regime should take heed witnessing that Muslims from Indonesia to Morocco have awoken to Islam and are demanding to be ruled and unified by Islam, and realize that the return of the Khilafah Rashidah (rightly guided Caliphate) is now a matter of time. We urge the Chinese regime to think wisely about the consequences of their misdeeds – and not treat our message like Khosrow II, Emperor of the Persia, treated the letter of our Prophet ﷺ. In his arrogance, Khosrow tore up his ﷺ letter, and by the will of Allah (swt), he soon lost his life and his vast empire was torn apart and conquered by the Khilafah. By Allah (swt)’s permission, the Khilafah Rashidah on the way of the Prophethood will be reestablished soon, and it will bring the victory to our oppressed brothers in East Turkistan, and will hold accountable all who oppressed them and stood against them. The Prophet ﷺ said: «إِنَّمَا الإِمَامُ جُنَّةٌ يُقَاتَلُ مِنْ وَرَائِهِ وَيُتَّقَى بِهِ» “The Imam (Khalifah) is a shield, behind whom you fight and protect yourself” [Sahih Muslim].